If you are running Microsoft Security Essentials with real-time protection enabled on a machine running ThinkVantage Access Connections you might notice the MsMpEng.exe service consuming most of your CPU time. This will cause your Lenevo laptop to run obnoxiously slow. Allegedly this issue was fixed with a new version of Access Connections but on a laptop I was working on the problem persisted even after I updated Access Connections. There are two ways to fix this: Add an exception to Microsoft Security Essentials or disable logging in Access Connections. Open up Microsoft Security Essentials and click on the “Settings” tab. Select “Excluded files and locations”. Click the “Browse…” button and select the “AccConnAdvanced.html” which, should be under “C:\Program Files\ThinkPad\ConnectUtilities\” by default. Click “OK”. Click “Add” and then “Save changes”. MsMpEng.exe CPU utilization should then drop to around 0%. Here is how you can disable logging in Access Connections (at least on Windows XP). Launch Access Connections: “Start”->”Programs”->”ThinkVantage”->”Access Connections”. Once Access Connections is up switch the view to “Advanced” by clicking the “Advanced” button in the upper right hand corner. Click the “Tools” tab and then “Diagnostics” and then the “Event Log” tab on the Diagnostics Tools screen. Click “Disable Logging” and then click “Close”. The AccConnAdvanced.html file should no longer grow and MsMpEng.exe CPU utilization should drop to nearly 0%. I recently started tinkering with the Appcelerator Titanium Development Platform and have run into a couple quirks. If you create a Titanium project on any drive other than C:\ on a Windows system, you will not be able to launch the Web Inspector. This is a apparently a known bug in Titanium Developer. The program can’t start because php_mbstring.dll is missing from your computer. Try reinstalling the program to fix this problem. Don’t bother re-installing anything. What is likely happening is that your pre-existing PHP installation added a “PHPRC” environment variable that points to your existing PHP install folder. I think Titanium’s command line PHP instance sees this variable and then attempts to use the php.ini file in that path. Your existing PHP installation folder does not likely have the PHP settings and/or module paths that Titanium needs so it breaks. To fix this without renaming your current PHP installation folder you can delete the “PHPRC” environment variable. Your existing PHP installation should work fine without it because PHP will look for the php.ini file in the same folder it is running from. 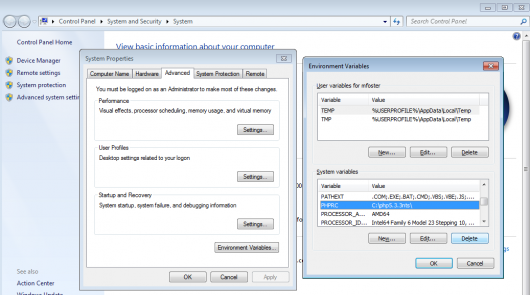 To delete the “PHPRC” environment variable on Windows 7, click Windows Start, right click “Computer”, left click “Properties” -> “Advanced system settings” -> “Environment Variables…” -> select “PHPRC” under “System variables”, and then click “Delete”. Hopefully you can now launch your Titanium application without an error and your existing PHP installation will continue to work normally. If you are attempting to run a newer version of CentOS as a guest on VirtualBox you need to install the “Guest Additions” on your CentOS VM to enable higher display resolutions. If you don’t, 800×600 and 640×480 will probably be your only options. This is in the manual of course but if you were in a bit of rush like myself you may have missed that part. 😉 Once you complete the “Guest Addition” installation process the CentOS guest desktop will dynamically re-size to match your view-port. Installing the Guest Addition will add some other handy features including a shared clipboard and shared folders. If you are running an older CentOS guest you may have to manually add additional resolutions to the xorg.conf file. The instruction at “0x100f36ec” referenced memory at “0x000c0194”. The memory could not be “read”. * Error Number: -1073741819 (0xc0000005). After some more trial error I was unable to get PHP to work without leaving the two lines commented. I tried both the VC6 thread and VC6 non thread safe versions and both exhibited the same behavior. On the PHP download page there is a “Which version do I choose?” section that basically explains that I should be using the VC9 version for IIS. Unfortunately I only saw the PHP 5.3.3 VC9 download and I wanted to test with PHP 5.2.14. I downloaded PHP 5.3.3 anyway and it worked. I guess I will be testing with PHP 5.3.3. On a somewhat related note, if you are using FastCGI with IIS, you will probably want the VC9 PHP 3.3.3 non thread safe version. This article explains why.